Offering classes in Cosmetology, Barbering, Facial Specialist, Nail Technician, Massage Therapy, Electrolysis and Laser Hair Removal. Total Academy has been licensed by the commission for Independent Education since 1986. We have been a recognized educational leader in the beauty industry for the past 27 years. Thousands of students have graduated from our Academy and gone on to enjoy successful careers in the salon/spa industry. Salon owners all over south Florida have praised the accomplishments of our students and continue to employee our graduates. We have gained the reputation as a progressive school that balances fundamental skills with innovative styles. 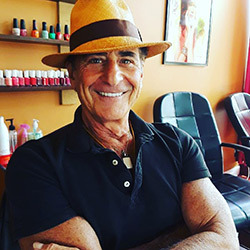 Gil Levin is the founding Director of Total Academy and has earned an excellent reputation in the community for both his academic and Artistic work. Total Nails and Hair Academy is referred to on this site as Total Academy for abbreviation purposes.